Business, marketing, tourism and manufacturing make up more than half of U.S. jobs — but students in high school probably don’t know that. Only one-quarter of the career and technical education classes students take are focused on these industries, according to a new report from the Thomas B. Fordham Institute, a conservative-leaning think tank in Washington, D.C. The study is a first-of-its-kind look at how career and technical education courses match up with U.S. job opportunities, and because of this, there are as many questions as answers, the report’s authors admit. Still, the findings provide a unique perspective on whether education is living up to the demands of the economy, as well as federal education policy that says CTE courses should prepare students for labor market needs. Nearly 90 percent of high schoolers take at least one CTE course. • Read more: Commentary: Are Los Angeles high school students ready for tomorrow’s job market? “We have to do a way, way better job of tracking this stuff — every state, every district should have its own version of this study and be monitoring it on a yearly basis,” said David Griffith, senior research and policy associate at Fordham, who wrote the report with Cameron Sublett, associate professor of education at Pepperdine University. While nationally, students aren’t taking many of the CTE courses associated with the most available job opportunities, there is some correlation at the local level. If local employment in arts, audio-visual technology and communications industries increases by 1 percent, the probability of a student taking a related course in high school increases by 14.8 percentage points. If information technology employment rises by 1 percent locally, the likelihood of a student taking a similar course increases by 10.2 points. Strangely, these findings aren’t as likely when looking at students who concentrate (take multiple courses) in a field. 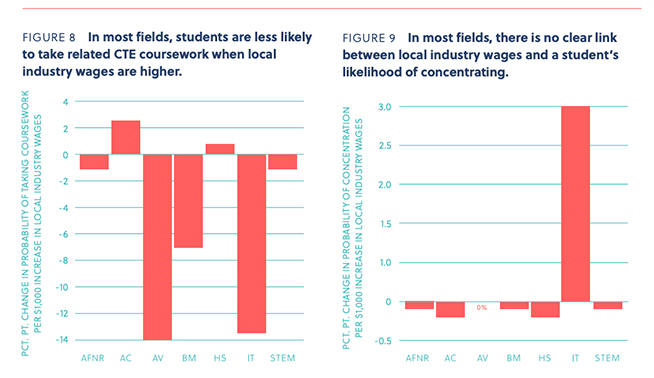 The study also found that when local wages are higher in a specific industry, students are less likely to take courses related to that industry. If wages in IT increase by $1,000, for example, the probability that a student will take courses related to IT drops by 13.6 percentage points and decreases by 14 points in arts, A/V technology and communication. But there is a slight increase for classes related to health science, architecture and construction when wages in those industries rise. While the tracking of students of color into low-paying professions through vocational education has been a troubling historical trend, the report authors didn’t find current evidence of this in their research. White students are most likely to concentrate in CTE, at 17 percent, followed by 14 percent of black students and 13 percent of Hispanic students. But there is still a wide gender gap. 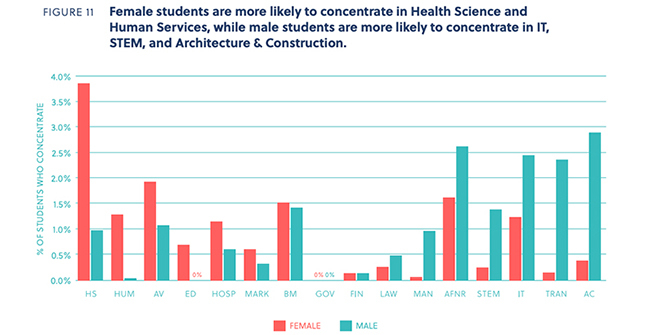 Female students are more likely to concentrate in health science and human services courses, while male students lean toward STEM and construction. The report authors couldn’t say whether schools are offering courses that align to industry and students just aren’t taking them or if the classes aren’t available. They do suggest that there is still work to be done connecting education with labor markets, especially as many adults are living close to their hometowns. Considering what “alignment” means can be a challenging problem in itself. Should leaders think about connecting high school classes with national or local markets? Should they consider current labor demands or forecast what an industry might need when today’s high schoolers have graduated from postsecondary institutions? The authors encouraged local leaders to do their own analyses as to what their industries and schools need. “My personal view is we should be trying to do more CTE, but it should not come at the expense of general education,” Griffith said. Part of the challenge of creating this report was matching CTE classes with Bureau of Labor Statistics classifications for 459 occupations. It wasn’t an easy fit, and not every class coincides perfectly with a job. For example, the career “Food Scientists and Technologists” was matched with the “Agriculture, Food and Natural Resources” high school course. This complex process shows that there’s more to be done to align education with workforce needs, Griffith said. “We can’t achieve workforce alignment if we can’t come up with classification systems for the classes and jobs that talk to each other,” he said. The report uses data from the National Center for Education Statistics’ 2009 high school study, the most recent available. It also uses employment statistics from metropolitan areas, which include some rural areas but don’t account for all rural populations.